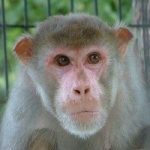 Dewey, a former lab monkey from Michigan, arrived at the PRC in 1997 at the age of 10. Dewey had endured years of invasive experimental procedures, including a catheter inserted into his brain to administer narcotic drugs. Dewey made a complete turnaround at the PRC, growing stronger and healthier each day. Dewey lived with a pigtail macaque named Crunchy, until she passed away in May 2015. She loved to groom Dewey’s soft hair and cuddle with him as they slept in their barrel.